Since the beginning of the RPG hobby, giants have been monsters to reckon with. Even the weakest giant towers over its foes and wreaks havoc with sheer physical strength. Give it armour, magic items, and the power of frost, fire, or lightning and your players have real problems. 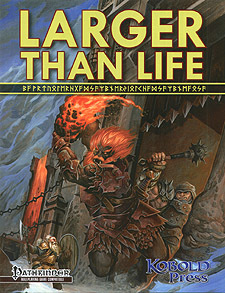 Larger the Life gives GMs everything they need to bring these terrifying titans to their table. This 76-page book by RPG Superstar Mike Welham offers Thursir, Hill, Frost, Stone, Fire, Cloud, and Storm Giant NPCs - plus new spells, feats and gear to strike terror into the hearts of puny adventurers.